The Wisconsin Department of Health Services provides mental health care services to Wisconsin residents with a focus on recovery, client rights, evidence-based solutions, and cost-effectiveness. Mental health services are provided within the community, as well as in psychiatric hospitals and secure treatment facilities. 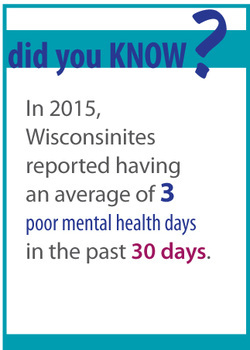 In Wisconsin, mental health services are supervised by the state and administered at the county level. 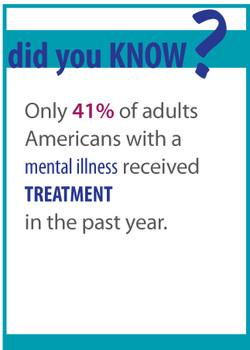 Approximately 19% of Wisconsin adults have a mental illness, and 4.6% have a serious and persistent mental illness. Community Support Programs - Mental health and case management services to adults diagnosed with a serious and persistent mental illness. Community Recovery Services - Home and community-based care to people 14 and over with a mental illness. Community Substance Abuse Services - Services including education, intervention, treatment, outpatient/inpatient care, and recovery programs. Client Rights Office - Ensure client rights are protected throughout mental health and substance abuse treatment programs and handle grievances from people receiving services. The 2013-2015 state budget allocated $28.9 million toward mental health services, an important step in the right direction for Wisconsinites. The $28.9 million allocation included: $12.5 million to expand forensic treatment units at the Mendota Mental Health Institute; $10.2 million to support the expansion of community-based care programs for those with mental illnesses; $3.7 million for DHS coordinated service teams for 38 counties and 5 tribes, addressing the care and services of families and children who are involved in two or more systems of care; $1.3 million for peer-run respite centers; $535,000 for the creation of the Office of Children’s Mental Health and Services to integrate and improve mental health services provided across the state and monitor state performance; and $524,000 for in-home counseling services for children and adults enrolled in BadgerCare. These positive changes were tempered by the State’s decision to reject federal Medicaid funds and close the gap in BadgerCare coverage. The Governor’s proposed budget builds off of the significant expansion of mental health services and supports in Wisconsin since the passage of the 2013-2015 budget. The proposed budget has several provisions regarding emergency detention, including the requirement that all individuals must be given a community-based crisis assessment by a qualified mental health professional before being held in emergency detention. Additionally, the Milwaukee County emergency detention pilot program would be eliminated. Mental health funding would be streamlined by consolidating funds into community aids that the Department of Health Services (DHS) would have to fund at a minimum of approximately $24.3 million each fiscal year for community mental health services. DHS is allocated an additional $1.5 million to use as grants to counties for mental health crisis services and aims to create more robust crisis services programs that would pair law enforcement with mental health professionals. The budget also proposes transferring all community-based juvenile delinquency-related services from the Department of Corrections (DOC) to the Department of Children and Families (DCF). These are juvenile support services, not correctional services, that are based on a juvenile’s individual risk and needs. Finally, the Governor’s budget proposes expanding Medicaid coverage to include the treatment portion of residential substance abuse programs. This would cost about $7.95 million over the biennium. An existing drug addiction program in the Department of Corrections would also be expanded by creating a voluntary pilot program for eligible offenders with an opioid addiction-related conviction. The Joint Committee on Finance (JFC) deleted the Governor's proposal to eliminate Milwaukee County's "24-hour" detention rule, which requires that Milwaukee County Mental Health Complex staff determine whether a person taken to the complex by law enforcement meets the criteria for emergency detention within 24 hours of the time that the person was taken into custody. In addition, the JFC eliminated the Governor's proposal to delete the Milwaukee emergency detention pilot program and instead extended the pilot program to run until July 1, 2017 (it was originally set to expire on May 1, 2016). The JFC also reduced funding for Medicaid coverage of residential substance abuse treatment programs by $2.57 million by delaying implementation of the plan to no sooner than July 1, 2016. The Legislature approved the Governor's proposed Mental Health Services budget as amended by the Joint Committee on Finance. Other than one gubernatorial veto deleting a requirement that Department of Health Services consult with the Wisconsin Counties Association before consolidating three community mental health programs into a single program, the final mental health services budget reflects the information contained in the above sections. Mental health services and supports are a critical part of supporting women’s health in Wisconsin. The expansion of residential substance abuse programs under Medicaid will help reduce barriers to treatment and recovery for Wisconsin women or their family members suffering from substance abuse. Additionally, the streamlining of mental health services funding into community health aids will help ensure flexibility and create efficiencies within programs.However, there should be a mechanism to make sure that these funds remain dedicated to mental health services. Milwaukee county has the highest known rate of emergency detention in the U.S., detaining about 13,000 patients per year. Approximately 32% of patients subject to emergency detention return to emergency care within 90 days. Mental health advocates have argued that this reliance on emergency detention traps patients in a cycle of short term detentions and does little to provide sustainable care or improve their overall health. The changes proposed to emergency care in the 2015-2017 budget are a step in the right direction to help ensure that individuals are provided appropriate mental health services and supports in all Wisconsin counties without an over reliance on restrictive options. Mental health advocates welcome the expansion of mental health services in Wisconsin. However, these newly expanded programs and policies are not reaching as many Wisconsinites as they could due to a lack of adequate funding and personnel resources. The Wisconsin Alliance for Women's Health.